The New Westminster Environmental Partners will be holding an Urban Transportation Forum and Annual General Meeting on Tuesday, November 9 at the Douglas College Student Union lounge. The event, moderated by Tenth to the Fraser’s Will & Briana Tomkinson (yep, that’s me! ), will feature local and regional transportation experts discussing what works in transportation planning, what doesn’t, and what’s coming to New Westminster. The time is now to talk about our transportation future. New bridges and highways are planned, bringing more traffic to New Westminster. The City is working on an updated Master Transportation Plan. An ongoing “funding gap” at Translink is delaying important transit infrastructure projects. Jerry Dobrovolny, Director of Transportation for the City of Vancouver and a former New Westminster City Councillor. He will discuss how the Olympics and Separated Bike Lanes are helping to Make Vancouver the “Greenest City in the World” by 2020. The presentation will include newly released data showing the shift in travel modes that occurred during games time, and discuss how cities can excel in a paradigm of peak oil and GHG reduction. Joe Zaccaria, a sustainable transportation advocate from South Fraser OnTrax. Joe will present some quick facts from our neighbours in the south-of-Fraser region, including options to decrease motordom and make our communities walkable again. What is driving transportation needs in the south of Fraser? What is being planned and what is being hoped for? What does these mean for the whole region? Jonathan Cote, New Westminster City Councillor. He will talk about how urban design and form affect sustainable transportation. He will also talk about road pricing and other issues in the local (New Westminster) and regional (Metro Vancouver) context. A Q&A will follow the presentations, so bring your questions, concerns, and ideas. You can also tweet questions @10thtothefraser or comment on this post to leave a question that you’d like Will & I to pose to the speakers during the forum. We’ll try to get to as many as we can during the time allowed. If anyone is interested in live-tweeting the event, that would also great too! Following these discussions, the NWEP will be reporting on this year’s activities, and will be electing new officers for 2011. Everyone is invited, admission is free and the general public is encouraged to attend and see what the NWEP is up to! You don’t have to be a member to attend, but only NWEP members will be able vote at the meeting. Memberships ($5 annually) will be available at the meeting. 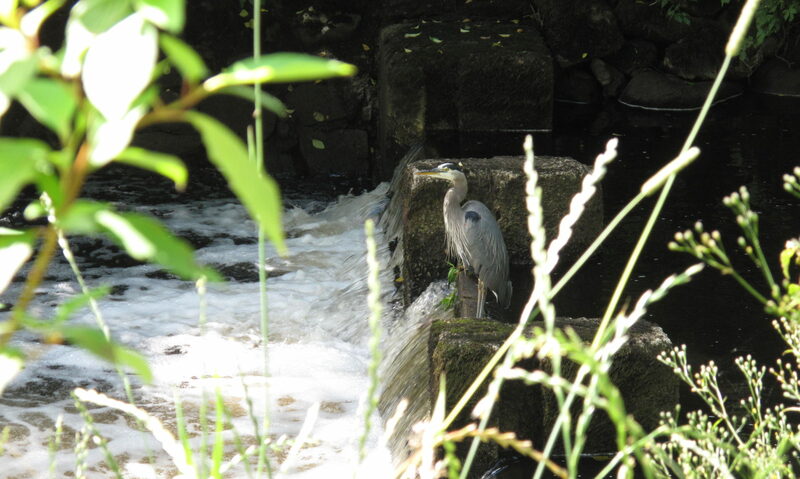 Who: New Westminster Environmental Partners are a group of residents, business owners, and other stakeholders who believe in thinking globally and acting locally. NWEP is strictly non-partisan, as we support sustainability being embraced by all political parties, organizations and individuals. Membership in NWEP is open to all residents and community stakeholderswho support our mission and are willing to work with us in a cooperative, consensus based-decision making process to promote sustainability in the City. 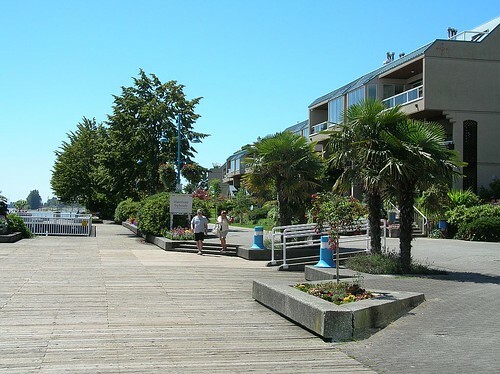 NWEP’s mission is to work with residents, businesses and government agencies within the City to achieve environmental, social and economic sustainability in New Westminster, through the identification of issues, education, public advocacy, the promotion of best practices, and the implementation of effective projects. This week is I Love Transit Week, a celebration of public transportation hosted by TransLink’s The Buzzer blog. 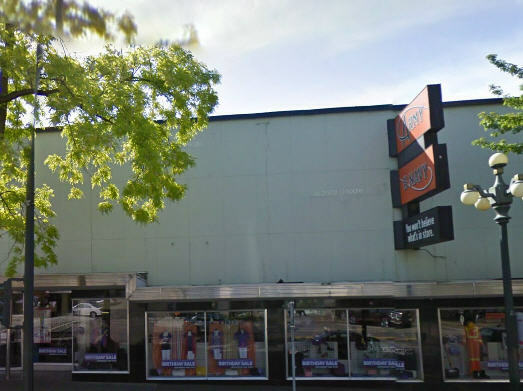 Join Buzzer blogger Jhenifer Pabillano and other transit-lovers Thursday, July 15 at The Heritage Grill in New Westminster for an evening meetup with food, games and fun! You can also enter to win a Summer Commuter Prize Pack from TransLink & Tenth to the Fraser. Odysseus stopped up his ears with beeswax because he knew alone, he would not have the strength to withstand the lure of the sirens’ call. I did the modern green equivalent. I never intended not to get my driver’s license. When I was eight years old, my mother bought a new Honda, and I remember asking her to hold on to our old car for me, so that I would have my own car to drive when I turned 16. I remember counting down to the magic day when I’d be allowed to get my driver’s license. But a funny thing happened when I finally did turn 16. Life got busy, and I put off writing my learner’s test. Then, at some point after that, my environmental conscience became activated. Suddenly not driving became a point of pride. Thirteen years later, as I come up on my 29th birthday, it looks like I will finally submit to the pressures of my husband, mother, friends and countless busybodies who have nagged me over the years to get my license. It irks me that people count it as a deficiency not to drive. While there are times when it certainly would have been more convenient, in my mind the karmic debt of adding to the plague of single occupant vehicles in the Lower Mainland outweighed the occasional frustrations. Now, with two kids and an increasingly complicated schedule of to-ing and fro-ing, I am forced to admit that the convenience of driving is sometimes a necessity, and that it is unfair for my husband to always play chauffeur. Guiltily, I am looking forward to having the freedom to go alone to places not well served by transit. I imagine gaily whisking my children off at the spur of the moment to do wild and wonderful things, singing happy road songs and stopping at a drive-through for cheeky treats along the way. But at the same time, I am fearful of giving in to this perception of ease, forgetting that there is a cost beyond the total at the pump and taking the car for granted. I’m afraid that freed of my self-imposed limits, I will turn into the kind of lumpen lazybones that drives to the corner store. I get little exercise as it is. 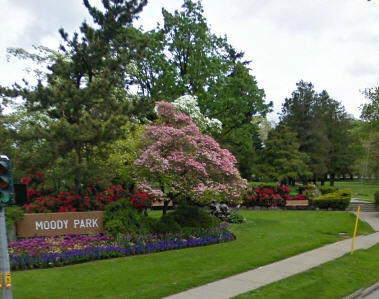 I don’t see the sense in driving to the gym so I can spend time on a treadmill when I could be walking my children to Moody Park Pool or muscling the stroller up and down hills to the SkyTrain station. As satisfying as those walks can be, I know if I had the choice to take the car, I would. It’s just too easy to indulge. Taking transit encourages frugal trip planning. If I can’t bus there, I don’t go. 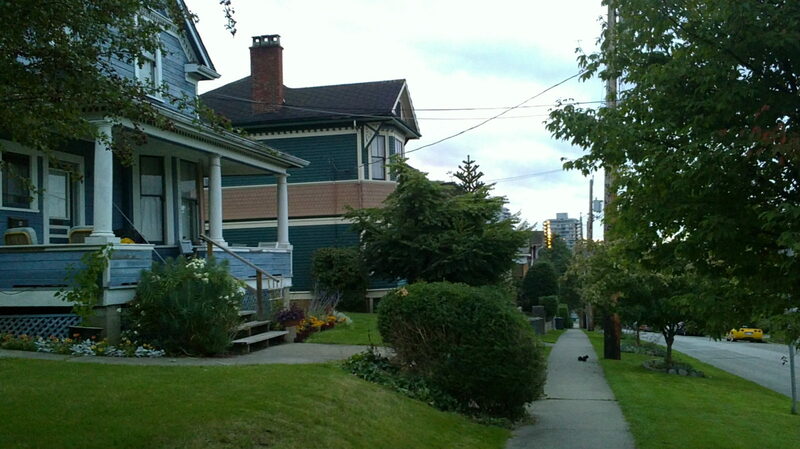 I live only in walkable neighbourhoods. I apply for jobs only on major transit routes. I plan to complete multiple errands per trip, and challeng myself to use only one bus ticket per trip whenever possible. In a car, the incremental cost of gas isn’t enough of a disincentive to really change transportation behaviour. But even an extra 15 minutes by bus can seem too much to bother. To some people, this might sound a bit masochistic, but it’s no different than a shopaholic freezing credit cards in ice. 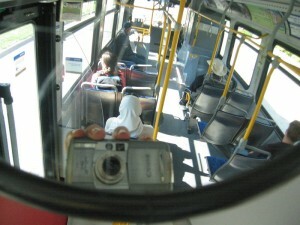 Sometimes it hurts, but I am convinced that taking the bus is good for me. 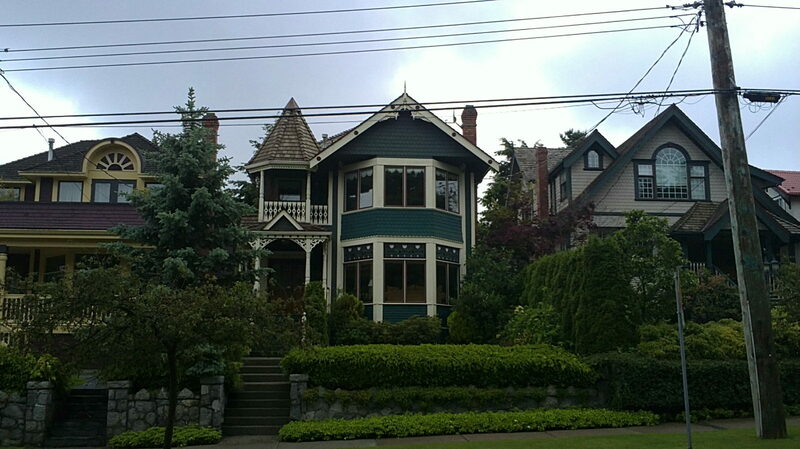 And this is (partially) what brought me to New Westminster. When the cost of an extra bedroom priced my husband and I out of the rental market in downtown Vancouver, our relocation choices were constrained by my reliance on public transportation. 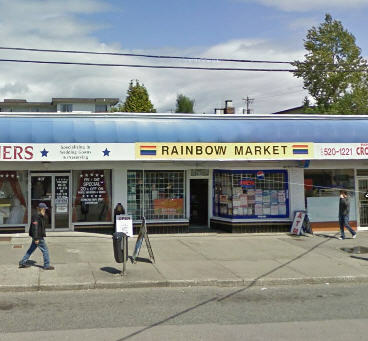 New Westminster, nexus of the Lower Mainland, was the next best thing to downtown for easy access to the places I needed to go. I miss walking to work, but in a city of just six square miles, I can walk almost anywhere I want to go (though here it really can be uphill both ways!). And yet there are five SkyTrain stations and buses every 15 minutes or less to all the main commercial districts. The commuting time to Vancouver is the same or faster by SkyTrain than by car at rush hour – and I can relax by reading or playing Bejeweled at the same time. I really do love transit. What can I say? I like to cheer for the underdog. I don’t think people give public transportation the credit (and funding) it’s due. I consider doing without a private vehicle a public good. I am hoping that the 13 years I spent doing without will help fortify me against the lure of easy driving. I may have to swallow my pride and drive the damn car, but I hope to continue my transportation diet of buses, SkyTrains and my own two feet. SkyTrain at New Westminster Station; a robust transit system is the sign of a real city (Image courtesy of Richard Eriksson). One of the reasons I moved to New West was for its transit system. I have two Skytrain stations (out of six in total here in New West) and four buses to choose from to get me home from downtown Vancouver, and the surrounding area. That enables my choice of a carless lifestyle – and choice is what modern living is all about. Listen: A robust transit system is one of the hallmarks of civilization. One of the things that the Ancient Romans gave to the Western world is a widespread way to get around the whole of their empire. Even then, one of the ways to draw their civilization together lay in a transit system to match the times, to suit the cultural paradigms and economic realities of the day, and to grow with a shifting population. They knew that it is the way to the future. In the ancient world, it meant roads. And today, it means an affordable, accessible public transit system that runs on clean energy, and stands as a force to change the world for the better. What? Change the world for the better? Isn’t that overstating things just a bit? I don’t think it is, actually. Now, it must be said that I’ve written about the need for public transit systems before elsewhere, particularly in public transit as a green building strategy. And sure, if more of us used public transit, there would be less automobile traffic, and therefore less carbon monoxide in the air, and less need to bore holes in the earth and risk our oceans and other natural habitats to keep those cars on the road. Nothing against car travel in general, mind. But, what if we didn’t need it? What if our priorities informed by a new vision of the future allowed us to consider petroleum dependence and mandatory multiple automobile ownership to be the remnants of a century gone by? When I said that one of the hallmarks of civilization was a transit system to suit the cultural paradigms and economic realities of the day, and to grow with a shifting population, this is what I meant. OK, so here’s something to consider. We need to think about how to re-define what it means to live in cities, and in suburbs too, in this 21st Century of ours. Simply put, I think we should leave traffic jams, enormous invisible clouds of exhaust fumes from millions of individual cars, and vast stretches of parking lots to hold those cars out of it as much as is humanly possible. And again, as much as automobile traffic isn’t intrinsically bad per se, what if we could allow people to move all around their cities without cars, from more points of entry? What if we could do it more efficiently, with less overall cost, with less pollution, and with less dependence on fossil fuels which is becoming a dead end in the sustainable energy stakes? What would happen if public and private sectors got together on this; companies, urban planners, community leaders, elected officials, academics, engineers, and more? What if these people enabled tracks and transportation hubs that could deliver you into the lobby of your building itself, because buildings, stations, and tracks have been entirely integrated into city planning? What if the money you spend on gas and insurance for your car could be split, with some of it supporting that system, and the rest supporting a better holiday, a home improvement project, or greater contributions to your child’s education fund with what’s left over? When I was a kid, the 21st Century, which was the Future at the time, was imagined as a consumerist’s heaven, with food in pill form, robot maids (which I’d still love, if any scientist eggheads are reading this) and appliances that could grill the perfect steak just by asking it nicely. But, that was a vision imagined in a time where this was what people were thinking most about, to wit; affordable, labour-saving goods. It was post World War Two during the fabled ‘Baby Boom‘. It was a boom period where consumer goods were concerned, too – like automobiles, folks – which were rolling off assembly lines. At that time, everyone could afford them, unlike during the Great Depression. And unlike now, in an age of increasing gas prices, and at a time of massive environmental damage related to unchecked industry. The Future as it was imagined was a 20th Century vision of what the 21st Century would be. But, now we’re actually here in the 21st Century. And now that outmoded vision of the future has to change. Thinking about new ways to travel to our jobs, to see our families, to shop, to go on vacations, and to feed economies which are sustainable are the new flying car, folks. Investment in the emerging technology in sustainable energy, and in turn made practical by a transit system that can support cities and suburbs that are planned around them are the keys to a new vision for what defines this epoch in history. To not invest in public transit is simply behind the times. The Ancient Romans gave the Western world roads. And it changed the world. We’ve come a long way since all roads led to Rome. Let’s treat our public transit as a necessity, and maybe the road we’re on will lead us into a future we can count on for better communities, better cities, better lives. 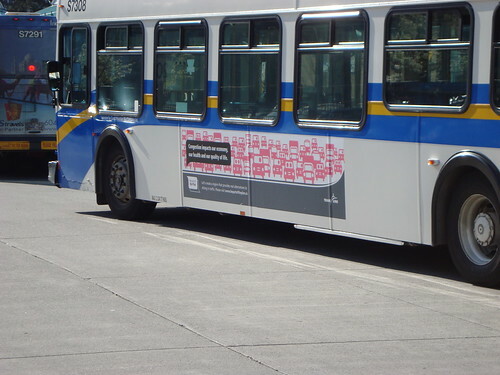 TransLink BC is helping us to celebrate I Love Transit Week, July 12-16. 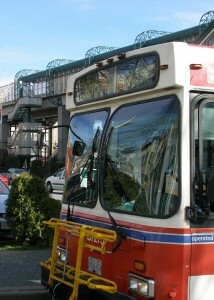 Check out the posts to be found on TransLink’s the Buzzer Blog for more information. Thanks everyone for playing – and sharing what you love about public transportation! The winner was picked via a random number generator. This week is I Love Transit Week over at the Buzzer Blog. TransLink blogger Jhenifer Pabillano describes it as “a low key but sincere celebration of what people like about transit (even though there’s much we don’t like! )” All this week, The Buzzer Blog will be publishing essays, photos and interviews about transit, and you’ll see some of these also in the printed edition of the August Buzzer on SkyTrain and buses. 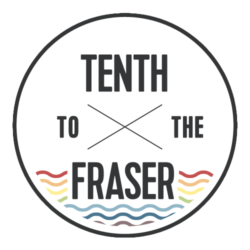 Tenth to the Fraser will be participating too. Look for two pieces related to transit in New Westminster to be published this week, one from me and one from frequent contributor Rob Jones. Transit and transportation is a huge issue here at the nexus of the Lower Mainland, so if you feel inspired to, feel free to submit a guest post about your take on the issues. 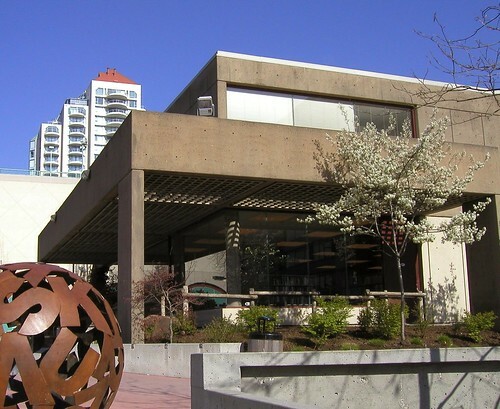 You might also like to re-read Rob’s piece about his daughter’s love for Columbia SkyTrain Station and perhaps visit the current library exhibit illustrating New Westminster’s transportation history. 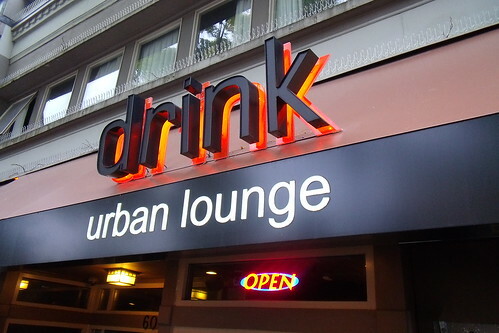 Then, on Thursday, July 15, Jhenifer is hosting an evening transit meetup called I Love Transit Night at New Westminster’s Heritage Grill. “I Love Transit Night” will feature food, fun and games. Here’s a link showing last year’s live meetup.